As a huge Duck Dynasty fan, the thought of a Green/Brown Woodland Camo Ring intrigued me. Oma was not disappointed. This high quality ring is both beautiful and comfortable to wear. I love the hint of green in the Woodland Camo ring inlay makes this ring go with almost any outfit. The company, Antler Rings, makes pieces that are great gifts for anniversaries, wedding days, or as a treat for yourself. They will also turn one of your Trophy Hunts or Mounted Antlers into a gift for him or her, and even your whole family! Did you know that most Antler racks have the ability to produce at least a handful of rings? Bonus: Antler Rings offer free shipping on all orders over $99.00. These rings are really awesome. My son loved the first one Oma received so much that I just had to give it to him! Click here for the Ring Size Chart. CAMO RING that is solid and rugged looking for you or your boyfriend, fiance, or husband, whether to be used as a CAMO WEDDING BAND or CAMOUFLAGE ENGAGEMENT RING, or just for your boyfriend as a birthday, Christmas, or anniversary gift. These are great unique statement ring for those who hunt, fish, and play in the outdoors in rural areas of the country. 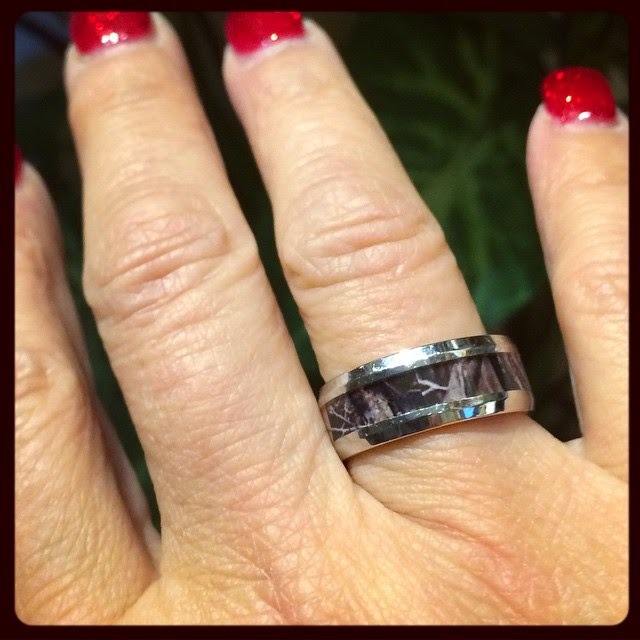 CAMO RINGS ARE GREAT GIFTS! 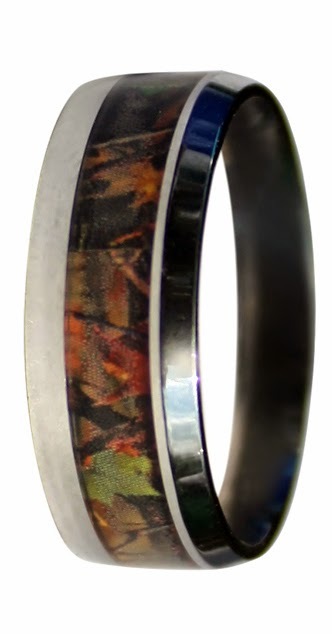 This ring features a beautiful inlay pattern of tree camo in the outdoors. What an affordable price for this unique piece of camo jewelry! This comfort fit camo engagement rings comes with a beveled edge and a sealed inlay so as not to be harmed by the elements.